Judges included Brenda Nasser, Ed Cline, Sarah Switek, Mary Jane Genochio, Steven Brownell Hall, Ruth Morrow, Arvid Morrow, and Cole Przybyla. Participating art teachers are Donna Guadagni, Suzanne Smith, Roger Salter and Cindy Biles from Calaveras High; Ken Baldwin and Mark Waelty from Bret Harte High; Martha Wallace representing Mountain Oaks and her private students. These dedicated teachers and professionals inspire the artist within each of their students, opening the door to creative expression -- enriching lives. Cheyenne Johnson, Conner Eastman, Daniel Benson, Darion Hay, Delaney Gray, Diana Munoz,Dustin Lawson, Gurpreet Kaur, Hailey Smoot, Hannah Cooper, Hannah Hughes, Hannah Mefford, Hayden Smith, Isabella Cook, James Breske, James Carlson, Jamie Lee Gehrmann, Jessica Stohlman, Jon Nelson, Jonathan Howard, Josh Massal, Karl Riedel, Kaylin Reed, Lauren Finley,Lucas James Cox, Madison Ward, Manjot Kaur, Mariah Anderson, Marissa Gzell, Matt Gurich, Michael McCullough, Melissa Franke, Michaela Smail, Pablo Zamudio, Sami Seider, Sarena Nichole Evitt, Shelby Winther, Suzanne DeSimone, Sydney Johnson, Taylor Woodard, Tommi Velasquez, Veronica Campos, Vincent Rinauro. Adriana Gonzales, Adriana Macias, Alessia De Ros, Alexandra King, Alexandra Martinez, Alexandra Mayfield, Allysa Cribari, Angelica De La Rosa, Audra Chase, Baily Ogle, Brandon McCleese, Bridgett McGinness, Brittany Church, Brittany Kohle, Caitlyn Troutman, Carmen Guerro, Cheyenne Souza, Courtney Stricker, Courtney Tarbat, Courtney Teicheira, David Rivera, David Rodriquez, Daysha Espiritu, Denise Carlin, Destiny Hundley, Elijah Valdez Erica Smith, Erynne Estoesta, Ethan Smith, Garrett Williams, Gizem Demir, Grant Perry, Haley Toleman, Hannah Jasper,Jaime Worthy, James Breske, Jamie Worthy, Jared Foley, Jennifer Cassidy, Jon Bryon, Jordan Fisher, Josie Moore, Kaylyn Hedstrom, Kelsey Orlopp, Kimberly Carlson, Linda Lane, Lora Jean Livezey, Madison Colborn, Maria Jose Solis Lopez, Marissah Lawrie, Max Smith, Mercedes Ball, Michael Spaeth, Michael Stickles, Michelle Geiszler Michelle Krauss, Morgan Couch, Morgan Wise, Nathan Bittle, Nick Lopez, Nicole Brengman, Olivia Borchin, Rachel Giudici, Rebecca Conley, Riley Shoemaker, Ryan Caynak, Samantha Beckett,Samantha Wise, Sarah Hernandez, Savanna Juarez, Scott Marston, Shelby Reynolds, Tessa Brawner, Tina Giudici, Trey Smith, Victoria Rose London, Zachery Johnson, Saraya Enos Ambar Moenich. Hop. But the goal of the Amador Choraliers remains the same, to bring the gift of song to their audiences. For the past 50 years, the Amador Choraliers have been entertaining audiences around the county and beyond with their Christmas and Spring concerts. Since the Amador Choraliers have been singing, over 150 talented musicians have shared their love of music along the way. Choraliers’ first performance was a midnight mass at St. Patrick’s church in 1962. The first Spring concert was held in May of 1963, under the direction of Robert Miller, and a tradition was born. The performances have always included a mix of classic to contemporary, gospel to Broadway show tunes and more. This year for their Golden Jubilee concerts, the Amador Choraliers will continue their musical tradition by sharing many favorite songs they have sung in the past. Some of the numbers included in this celebration concert series are Riders In The Sky, Steam Heat, and selections from The Music Man. Also as a special treat for the Saturday night and Sunday afternoon performances, the current members will be joined by over 30 alumni members to sing "Just A Closer Walk" and selections from The Sound of Music. This expanded chorus will be conducted by the original director, Robert Miller, who retired after 32 years with the group. The concert dates and times are May 2nd at 7:30 pm at the Cornerstone Church in Ione, then May 4 at 7:30pm in the Sutter Creek Auditorium and May 5th at 3:00pm, also in the Sutter Creek Auditorium. Tickets for these events are Jubilee priced at just $5.00 and may be purchased in advance at the Amador County Chamber of Commerce, 115 Main Street, Jackson, or call (209) 223-0350 for credit card purchases. and much more. For information call Carole at (209) 743-9258. Message from the Mother Lode Friends of Music: Schedule change for "The Family Crest"
Dear Friends of Music: The date of the concert of The Family Crest, the contemporary indie rock group from San Francisco, has been changed from Saturday, May 18 to Saturday, May 11. Full details about this exciting breakthrough event for the Friends of Music will be sent to you shortly. Jackson Rancheria Casino, upstairs at the Lone Wolf. Check the time by calling the Rancheria Casino . Lone Wolf Restaurant & Lounge features luxury and comfort combined with approachable entrees focused on local quality ingredients and precise execution. The lounge offers fine liqueurs and spirits, a great variety of California wines and an extensive lounge menu. Enjoy comfortable indoor or veranda seating, and find out what the wolf is howling about. Lone Wolf proudly brews and serves an exclusive blend of coffee from Napa Coffee Roasting Company. Lounge open Wednesday through Sunday at 4 p.m. Dining Room open: Wednesday, Thursday & Sunday 4 p.m. to 9 p.m. Friday & Saturday 4 p.m. to 10 p.m. Dining Room closed Mon. and Tues.
Lone Wolf Restaurant & Lounge features luxury and comfort combined with approachable entrees focused on local quality ingredients and precise execution. The lounge offers fine liqueurs and spirits, a great variety of California wines and an extensive lounge menu. Enjoy comfortable indoor or veranda seating, and find out what the wolf is howling about. Lone Wolf proudly brews and serves an exclusive blend of coffee from Napa Coffee Roasting Company. Lounge open Wednesday through Sunday at 4 p.m. Dining Room open: Wednesday, Thursday & Sunday 4 p.m. to 9 p.m. Friday & Saturday 4 p.m. to 10 p.m. Dining Room closed Mon. and Tue. and thinking more broadly. Her works hope to surprise and force us to come to grips with the unexpected. filled with delightful surprises. "Gardens of the Mind" is indeed a joyful entrée into spring. Ms. Dixon maintains a studio in downtown Jackson, painting full time. She specializes in figurative work, doll imagery, botanicals and portraiture by commission. The public can get to experience Sarah and her paintings at a reception in her honor on Saturday, March 2, from 2 to 4 p.m. at Gallery 10, 15 Eureka Street, Sutter Creek. The gallery is open Thursday through Monday from 11:00 - 5:00 p.m. Call the gallery for possible additional hours at 209-267-0203 or visit their website at www.gallery10suttercreek.com. Sarah's show will be featured through most of March. Our new potter: Janet Piccola, a 20-year resident of Amador County has recently joined the co-op of local artists at the Sutter Creek Gallery. Janet retired from CalFire and found a new calling working with clay. She learned the art of throwing on the wheel from Pioneer resident Jerry Illers, and enhanced that knowledge with sculpture classes and other clay classes at the Quyle Kilns studio in Murphys, CA. She brings varied pottery styles to the gallery as she continues to grow as an artist and continues to explore the many wonders of working with clay. Please join us in celebrating her participation in our gallery at the First Saturday open house, Saturday February 2. Gallery hours are 10 - 7 that day, with the featured artist reception beginning at 4pm. Her work will be featured throughout the month of February. Charcoal and conte pastels artist: Julie Muela-Farris is our other new addition who will also be featured all month and be at the First Saturday reception. Raised in the Lodi/Lockford area, she grew up in the country where her family had horses. A Lodi High School art teacher encouraged her to expand her work beyond her parents refrigerator and she went on to Delta College, enrolled as an Art Major. She stopped drawing for 10 years, working in the financial field, but in 2009 came back to it as a way of coping with her mother’s being diagnose with cancer. Since then she has earned ribbons at the Lodi Grape Festival in 2011 and ‘12, and received honorable mention for “Team Work” at the Draft Horse Classic in Grass Valley. Horse, carting and the country life are her favored themes. Sutter Creek Gallery is privileged to have both these fine artists in our co-op. Welcome the arrival of Spring with live musical performances at Petroglyphe Gallery in historic downtown Mokelumne Hill. Petroglyphe Gallery’s Spring Sunday Fine Arts Concert Series will be held March 24, April 21, and May 19 from 3:30 – 6 pm and the public is cordially invited to attend. Tickets for limited seating will be available for $21 in advance and if available, for $23 at the door. These special events will include light appetizers and wine to be served from 3:30 pm until the performance begins at 4 pm. Petroglyphe Gallery’s beautiful Main Street space creates a unique atmosphere that melds the visual and musical arts in a relaxed and intimate setting. Each concert will focus on a different musical style performed by well renowned professional musicians. The March 24 concert will be given by Allen Biggs, principal percussionist for the Santa Rosa Symphony and the percussionist for the Wickedproduction in San Francisco. The April 21 concert will feature jazz and classical harpist, Motoshi Kosako, principal harpist for the Stockton Symphony Orchestra. The final spring concert on May 19 will highlight the classically trained violinist and violist, Debbie Dare and violin virtuoso, Joseph Gold. With such a variety of musical styles, the Spring Sunday Fine Arts Concert Series at Petroglyphe Gallery promises to awaken your passion and enliven your senses! For more details on this exciting concert series, or to purchase tickets, please visit the gallery’s website at www.gallerypetroglyphe.com or call209-286-1387. Regular hours of Petroglyphe Gallery are Thursdays through Saturdays 11:30 am - 5:30 pm and Sundays 11:30 am - 4:00 pm. Petroglyphe Gallery is located two blocks off of Highway 49, across the street from the historic Hotel Legér in the historic gold rush town of Mokelumne Hill. The Children's Studio has a few openings for new students this spring. We will be working with clay, printmaking, painting and construction. Please call Pam Sharp to reserve a regular spot - 245-3910. Classes are offered Tuesday through Friday, 2:30 to 3:30 and 4:00 to 5:00. Cost is $10 per lesson (second child in a family, $5.00) Group size limited to 6. Ages 5-15. · Groups of 2-5 artists collaborate on single murals at a “host” studio. vignettes, done in acrylic paint, no larger than 11”X17”. mural paid on final delivery. · Murals become the property of AmadorArts. The Art Review Committee of Lucile Packard Children’s Hospital at Stanford is seeking applications from qualified artists, to be considered for future commission or purchase of artwork, installing in 2016, at the LPCH New Expansion Project in Palo Alto, California. With opportunities for a variety of sculptures of different sizes, and two-dimensional art of various media, the Call for Artists includes artworks ranging from $450 to $25,000. Please visit the LPCH Call for Artist project website: www.lpchcallforartists.com for all information, including the most up-to-date version of the Call for Artists, the application form, and “how to apply” instructions. Applications will be accepted through the project website starting on March 23, until the application deadline of April 22, 2013. Please submit any questions concerning this Call for Artists using the Questions tab of the project website: www.lpchcallforartists.com. Thanks for supporting the Arts in Amador County! Wishing you a Very Happy & Colorful Easter! (an annual special invitation), and made special appearance at the Berkeley City Club. Lone Wolf Restaurant & Lounge features luxury and comfort combined with approachable entrees focused on local quality ingredients and precise execution. The lounge offers fine liqueurs and spirits, a great variety of California wines and an extensive lounge menu. Enjoy comfortable indoor or veranda seating, and find out what the wolf is howling about. Lone Wolf proudly brews and serves an exclusive blend of coffee from Napa Coffee Roasting Company. Lounge open Wednesday through Sunday at 4 p.m. Dining Room open: Wednesday, Thursday & Sunday 4 p.m. to 9 p.m. Friday & Saturday 4 p.m. to 10 p.m. Dining Room closed Mon. and Tuesday. Stockton Singles Dance, Stockton Elks 8900 Thornton Rd., couples welcome. 7 p.m. Thick Soup and Old Soles!! (that's 2 exclamation points for 2 band s)A fundraiser for KQBM 90.7 FM, our new community radio station. Local radio serving the central Sierra Nevada mountain range counties of Calaveras, Amador and Tuolumne.Pine Grove Town Hall, 7pm-10pm. *Sign Ups for the CBA Music Camp are now open - and look who's teaching the Old-Time Stringband class! 2013 Summer Camp dates: June 9th -12th (Sunday -Wednesday) in Grass Valley, California This is a great music camp with a unique format. You spend three hours each morning for three days with the same instructor, in small classes, usually around 1 instructor for 10 students! That's a wonderful opportunity to get one-on-one, in depth instruction and attention, and GEFF AND MARSHA Teaching the Old-Time Stringband class. Sign up NOW, places are very limited. There's a reason they call it "Playing" music - come have fun! Volcano Union Inn 4:00 P.M.
Local percussionist, Allen Biggs, will perform on March 24 to open Petroglyphe Gallery’s Spring Sunday Fine Art Concert 2013 Series and you are invited to attend! Tickets for limited seating will be available for $21 in advance and if available, for $23 at the door. This unique musical event will be preceded by a reception with light appetizers and wine to be served from 3:30 pm until the performance begins at 4 pm. Allen Biggs is the percussionist for Wicked in San Francisco for which he plays 48 instruments. He is also principal percussionist for the Santa Rosa Symphony, and has played in that orchestra for over 25 years; he has performed with the California Symphony for 23 years. In addition, Allen plays drums in the funk/jazz band Jamalicious and is an instructor at San Francisco State University. Music from all over the world continues to fascinate him, as does the intersection of sound, noise, and music. Allen will be playing the marimba during his performance at Petroglyphe Gallery and has promised to bring some unusual instruments to encourage audience participation. Virtually anything he can get his hands on becomes a musical instrument…so watch out for your car keys and hub-caps! For more details on this exciting concert series, or to purchase tickets, please visit the gallery’s website at www.gallerypetroglyphe.com or call 209-286-1387. Regular hours of Petroglyphe Gallery are Thursdays through Saturdays 11:30 am - 5:30 pm and Sundays 11:30 am - 4:00 pm. Petroglyphe Gallery is located two blocks off of Highway 49, across the street from the historic Hotel Legér in the historic gold rush town of Mokelumne Hill. 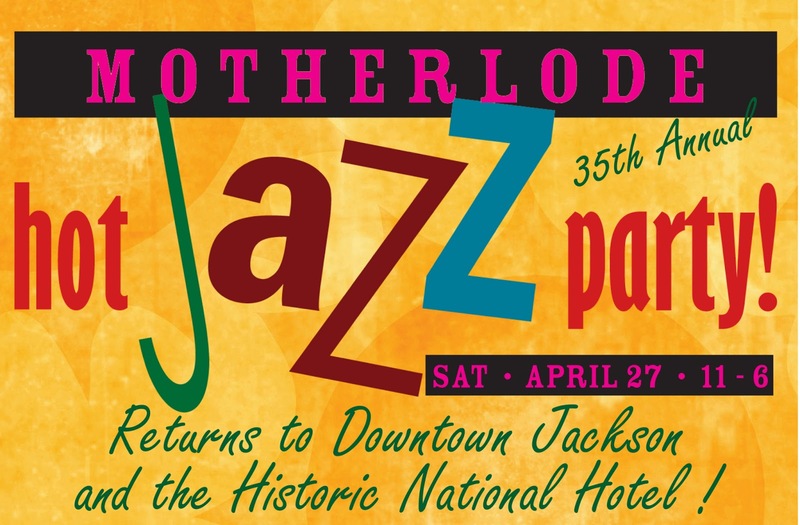 The Motherlode Hot Jazz Party returns to its roots, rolling out the good times on Saturday, April 27 at four venues in historic Jackson, including the newly renovated National Hotel where it all began 35 years ago. Seven of California’s swingingest bands will play from 11 – 6 and bands will rotate around to four very different Jackson venues: The National Hotel on Main Street, Teresa’s Place on Jackson Gate Road, Thomi’s Cafe Banquet Room on Hwy 49 in the Motherlode Plaza, and The Hub on Main Street. The Hub, on the top floor of the historic Krabbenhoft Building, is a new venue for the Hot Jazz Party this year and was once the town ballroom. 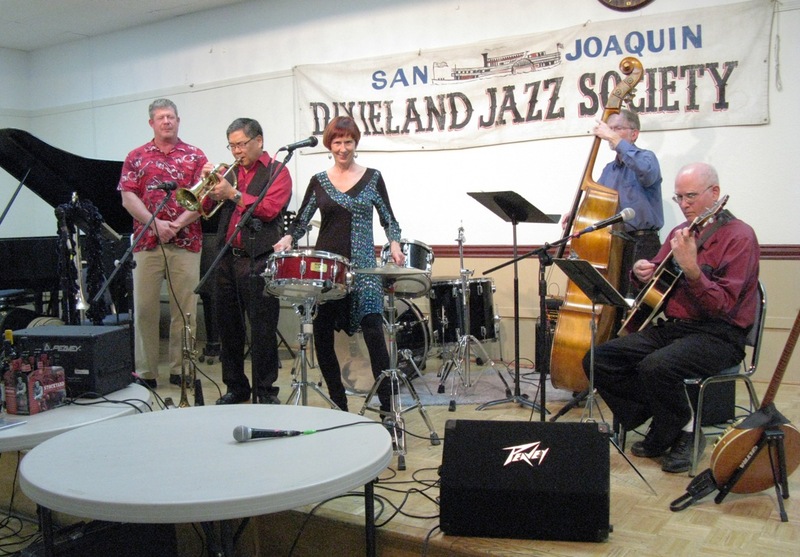 Proceeds from the Hot Jazz Party will go to support The Arc of Amador and Calaveras, providing services to people with developmental disabilities and to the Jackson Business & Community Association. Admission badges costing $20 each in advance (through April 25) may be purchased on-line at www.visitjacksonca.com or by calling 209-418-5407. The day of the party, badges will be $25, available at any of the venues. 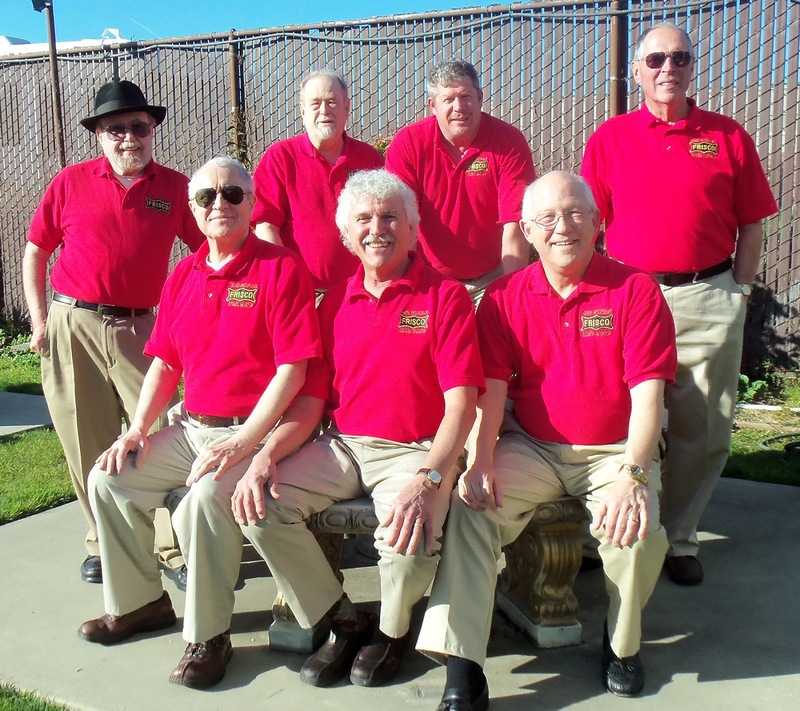 The very popular Bob Schulz Frisco Jazz Band will headline the daylong festivities. You may hear bits and pieces of Muggsy, Murphy, Armstrong, Condon and Berigan from the Frisco Jazz Band. One of the most talented groups on the West Coast today, their style is patterned after the late Bob Scobey Frisco Band of the '50s and early '60s. Scobey was never comfortable with terms like "traditional jazz" or "New Orleans jazz" ... he was more of a free musical spirit than a conformist. Bob Schulz is one of the foremost performers of the Scobey style of trumpet and is an outstanding vocalist in the tradition of Clancy Hayes. Some members of his band are alumni of the Scobey and Turk Murphy bands and they enjoy performing in the styles that have been influenced by all the greats -- both past and present! Bob Schulz: Cornet, Gary Reynolds: Trombone, Paul Edgerton: Reeds, Scott Anthony: Banjo, Bob Ringwald: Piano, Darrell Fernandez: Bass, Jeff Hamilton: Drums. Forty-four years and still going strong, the Natural Gas Jazz Band from San Francisco loves its audiences and the audiences love its blues, stomps, rags, marches, and spirituals. This traditional mainstay first played in Jackson at the National Hotel in 1978and returns to the festival for the 34th time. You’re going to love the virtuosity of the individual musicians, the variety of tunes and complete mastery of different styles, great arrangements and the band’s incredible tight execution. These internationally-known ambassadors of jazz have played around the globe, from Tasmania to Siberia! 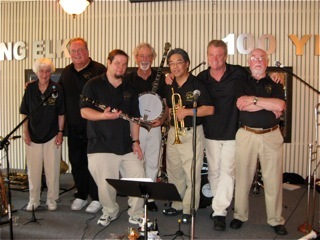 Phil Crumley: Cornet, Rich Owens: Piano, Bob Murphy: Sax, Bill Carson: Trombone, Carl Lunsford: Banjo, Jim Brennan: Tuba. One of the most interesting and exciting front lines on the jazz festival circuit! Midnight Rose Jazz Band features two sisters: Dannie Balser-Singinghawk on trumpet and Nancy Kries on clarinet AND Nancy’s sons, Jeff Kries on trombone and Tim Kreis on tenor sax. 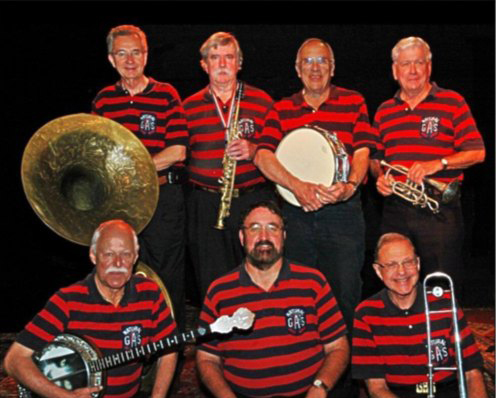 They serve up an eclectic mix of mainstream Dixieland with a taste of swing, a dash of novelty tunes, topped off with crowd-pleasing humor and just plain fun! Backing-up are Ben Marcelo: Piano, Reuben Smith: Bass/Tuba, Carl Warmdahl: Drums. A Sacramento favorite, the Catsnjammer Jazz Band has four vocalists and a thick songbook with top notch traditional New Orleans and San Francisco-style jazz, plus an occasional contemporary tune. This hot band knows how to mix it up! A featured band at the Sacramento Jazz Jubilee (now Music Festival), the Catsnjammers are thrilled to be coming back to Jackson for the Hot Jazz Party. Special guest Chuck (“007”) Bond: Cornet, Tom Schmidt: Clarinet/Sax, Brian Richardson: Trombone, Kurt Abell: Banjo/Guitar, Jean Levinson: Tuba, Trent Teague: Drums. The Bob Williams Muscat Ramblers is the musical magic that happens when five of Sacramento’s masters of jazz perform together. Any band with Bob Sakoi (Jass City Jazz Band) on trumpet is going to be popular! Bob Williams, trombonist extraordinaire, is past-president of the Sacramento Traditional Jazz Society; Bill Dendle is one of the country’s top banjo players and is the director of three jazz camp programs. Shelley Burns is a premier West Coast jazz vocalist who can mesmerize with a beautiful song or fracture an audience with laughter. And they’re backed up by able bassist, music coach and author, Shelley Denny. Extraordinary entertainment! 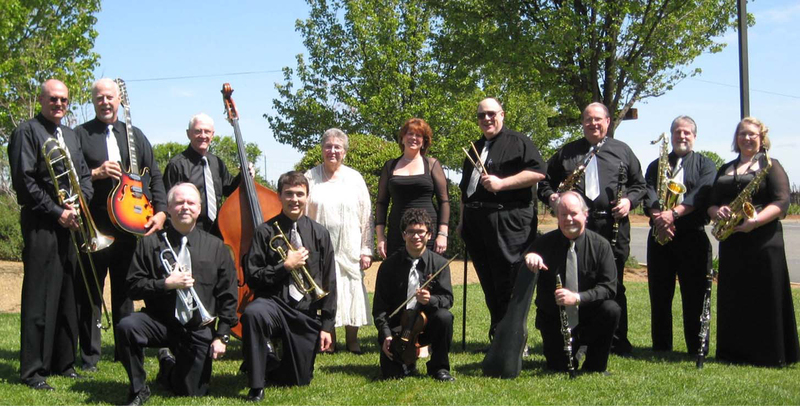 The Speakeazy Jazz Orchestra, a 10-piece dance orchestra in the style of famous 1920’s hotel bands, was formed in 2008 and features some of the Gold Country’s top professional musicians. SJO features dance tunes from the 1920’s and 30’s era -- rumbas, tangos, cha-chas, waltzes, and more! Organizing the band are Steve and Jeff Chambers, both former members of world famous Royal Society Jazz Orchestra. Ernie Kapphahn: Alto Sax/Clarinet, Chrissy Sleigh: Alto Sax/Clarinet/Vocals, Jeff Chambers: Trumpet/Vocals, Larry Coombes: Trumpet, Eric Johnson: Trombone/Vocals, Tom Sharkey: Banjo, Arlene White: Piano/Vocals, Irv Gidding: Bass, John Lillie: Drums, Sam Price: Violin, Steve Chambers: Clarinet/ Saxophone. Prepare to be impressed by The Replacements. Teaming up after playing together at the Sacramento Jazz Camp, The Replacements are a product of the youth education program supported by the Sacramento Traditional Jazz Society. 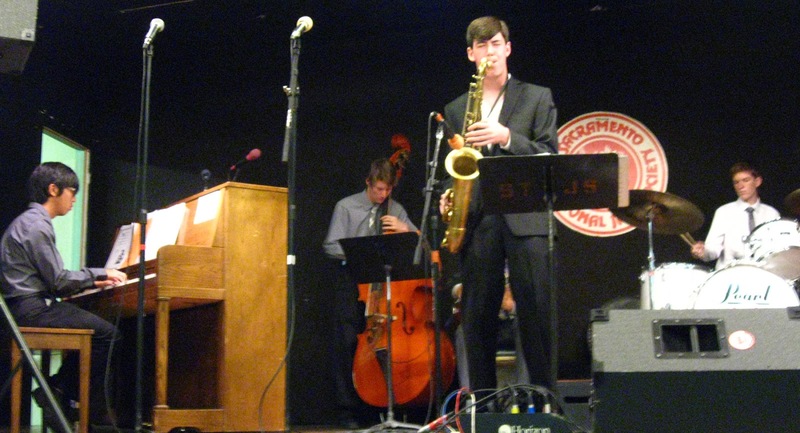 Each performer was also selected as a youth all-star at the 2012 Sacramento Music Festival. Presenting a more modern approach to jazz, you won’t be disappointed with what you hear -- when they play, it’s all about the music! Tim Kreis: Tenor Sax, Matthew Seno: Piano, Devan Kortan: Guitar, Dexter Williams: Bass, Carson Messer: Drums, Angie Reed: Vocals. Free shuttle service, provided by the Jackson Rancheria Casino Resort, will run continuously to and from all the jazz centers and city parking lots from 10 am – 7 pm. RV parking is available at the Busi Parking lot on Highway 49 (also the entrance to Mel & Faye’s Diner). Units must be self-contained. For on-line ticket sales, a map of the venues and more information visit www.visitjacksonca.com or call Jackson Business & Community Association, 209-418-5407. The AmadorArts Gallery, the newly opened tiny gem of a gallery in Sutter Creek, will be featuring the work of longtime and adored local artist Molly Haines Kohlschreiber for the month of April. Kohlschreiber creates in watercolor, oil, acrylic, mixed media, monoprint, photography, and pastel. Her subjects are landscapes, desert scenes, images of her travels, local scenes, florals, photoglyphes, and her first love, horses. A reception in her honor will be held at the gallery on Saturday, April 6, from 4-6 pm, coinciding with the Amador 1st Saturday Art Trek. Now in her mid-seventies Jackson resident Kohlschreiber has spent her entire life devoted to art, with the longest time spent as art instructor at Victorville Valley College, Victorville where she shared her expertise for 30 years and was Chair of the Art Department by the time she retired and moved to Amador County. Her passion for art appeared at an early age. She started drawing at about 4 years old and received her first set of oil paints at age 9. Her education includes a BA & MA, Cal State Long Beach, graduate work UC Santa Cruz, Santa Barbara, and Riverside. Kohlschreiber is a signature member of Watercolor West and an associate member of Horse Artists Association, has conducted workshops in several western states, and has been juror for many major exhibitions. She‘s exhibited in many galleries and in numerous one person shows. A partial list includes Maturango Museum, Ridgecrest; Shenandoah Winery Gallery, Plymouth; 29 Palms Gallery; Fine Eye Gallery, Sutter Creek; Coal Creek Gallery, Cedar City; Riverside Art Center; Museum at Northern Arizona, Flagstaff, and Gallery 10, Sutter Creek. AmadorArts is proud to present Molly Kohlschreiber who was once an active member on the Board of Directors of AmadorArts.